U.S. #3373-77 – The first and only missile mail was launched from a U.S. Navy submarine. On June 8, 1959, the U.S. Post Office Department launched its experimental missile mail in an attempt to find a faster method of mail delivery. The idea of using rockets or missiles to deliver the mail stretches back hundreds of years. The first person to suggest such a form of mail delivery was German author Heinrich von Kleist. In October 1810, he wrote an article in his newspaper, the Berliner Abendblätter, proposing that fixed artillery batteries be used to fire shells filled with letters. He believed that a letter could be sent from Berlin to Breslau, about 180 miles, in half a day. 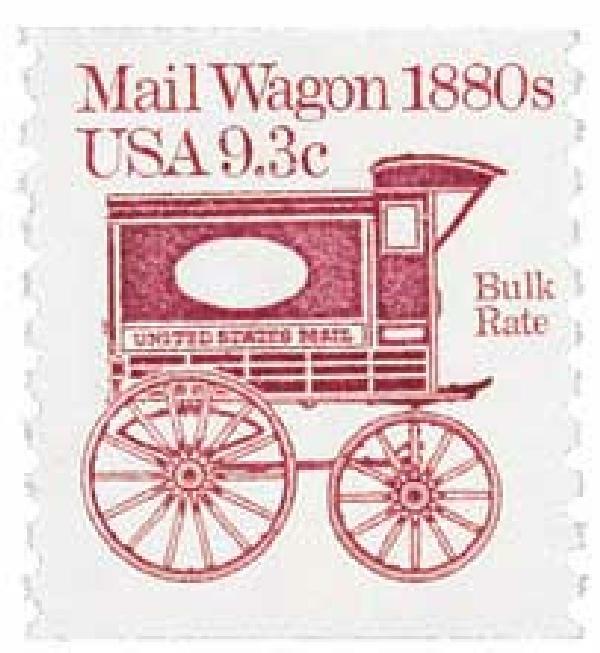 U.S. #1903 – Mail wagons became widespread with the introduction of Rural Free Delivery in 1896. The idea was actually put into practice decades later in Tonga, but found that it was unreliable. The first rocket mail was launched in April 1931with 102 pieces of mail between Schöckl and St. Radegund, Austria. That flight was successful and several others were staged through 1932. The rocket mail craze spread to several other countries and was usually supported by stamp collectors. In India, Stephen Smith, Secretary of the Indian Airmail Society, began launching mail rockets in September 1934. In the course of a decade he launched over 270 rockets, 80 of which contained mail. He had a number of victories, including the first rocket mail sent over a river and the first to carry a parcel. His accomplishments were honored in 1992 with an India postage stamp. 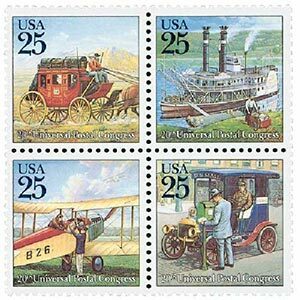 U.S. #2434-37 pictures several methods of classical mail delivery. America began experimenting with rocket mail as well. The first U.S. rocket mail delivery occurred in February 1936. Two rockets were launched from New York and landed 100 yards away. This success led to further experiments. Then in 1959 the U.S. Post Office Department was ready to launch the first missile mail. Working with the U.S. Navy, they established a postal branch on the USS Barbero submarine. They then fitted submarine with a Regulus cruise missile, whose nuclear warhead was replaced by two mail containers. The 3,000 letters it contained were largely commemorative covers from U.S. Postmaster General Arthur E. Summerfield addressed to President Dwight Eisenhower, government officials, members of the Universal Union, and more. 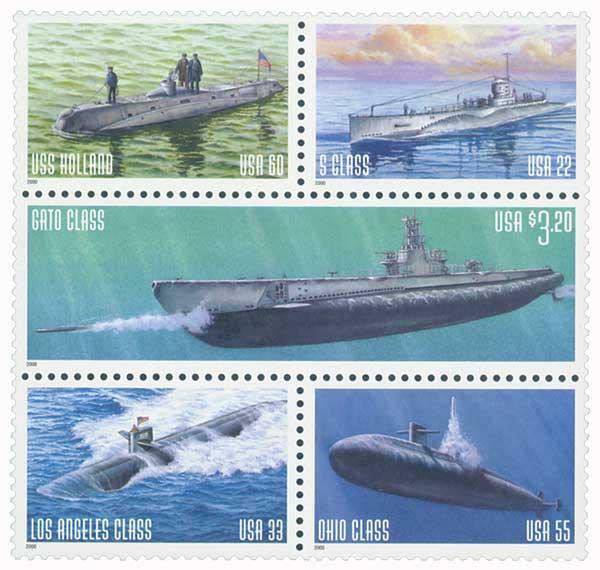 Before the submarine was launched, each cover received a “USS Barbero Jun 8 9.30am 1959” cancellation. U.S. #1489-98 shows several jobs carried out by U.S. postal workers. That day, June 8, 1959, the U.S. Post Office Department launched this missile mail from the submarine to the Naval Auxiliary Air Station in Mayport, Florida. The missile traveled about 600 miles per hour, reaching its destination 100 miles away in about 22 minutes. 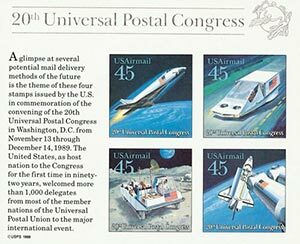 U.S. #C126 – A companion to the Classic Mail Transportation stamps, these airmail issues picture potential mail delivery methods of the future. Despite Summerfield’s excitement, few others saw missile mail as a practical means of delivery. The Department of Defense believed the experiment proved the accuracy of U.S. missile capabilities. And many believed the cost of missile mail was too high to be practical. Click here to view photos and a cover from the first and only missile mail delivery. 12 Responses to "This Day in History… June 8, 1959"
very interesting in the history of USPS Delivery Mail wow. I saw US# 3373-77 stamps but didn’t know the story behind it. Never heard about missile mail. Thanks Mystic for interesting story. Never knew about this either. Fascinating story. Wow, first I ever heard of “missile”mail! Hmmmm, very interesting. Something seems to be missing from “this day in history” story, or I missed it. I wonder how the landings of these missile shots were accomplished? Parachutes or just huge catchers mitts? I went to the pictures link. You assumed, as did I, that it was a polaris missile. It was actually a Regulus cruise missile that has the capability of landing on airplane type landing gear. Wait till Domino’s hears about this. What a wonderful story. I have been collecting stamps for many years and have never heard of this. Never did know that this way of mail delivery, ever took place. There was never any mention of the Pony Express in mail delivery. Maybe I took it for granted that tthe Pony Express delivered mail besides important messages. Please inform me if I was correct or mis-informed.. Thank you Mystic for your wonderful history lessons.